Pure Enrichment PurePulse Pro TENS Unit Muscle Stimulator About the product Learn how to get maximum relief from PurePulse Pro with our FREE Pain Management Video Series, which demonstrates how to use the PurePulse Pro and provides detailed exercises and advice for treating pain in your neck, shoulders, back, arms, hamstrings, buttocks, knees, and more FDA Approved and 2 Year Warranty – Your satisfaction is guaranteed Customize your treatment with the easy-to-use LCD display, which lets you select from 8 preset therapy programs and adjust the timer from 5-60 minutes Get medical-grade pain management from the comfort of your home with the leading choice of physical therapists and chiropractors nationwide Explore 25 different therapeutic intensity levels designed to treat all types of people and muscle groups–Intensity levels range from gentle pulsations for sensitive areas to more aggressive pulsations for larger muscle areas Product description Give your tired, sore muscles the gift of daily, hands-free massage therapy with Pure Enrichment’s PurePulse Pro. 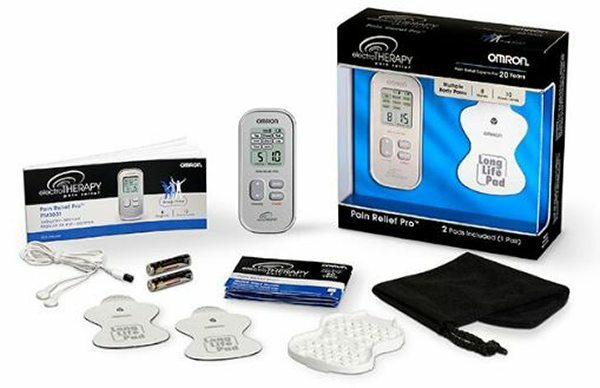 Our powerful, clinically proven, pocket-sized electronic pulse massager provides the same office-quality muscle and joint pain therapy you would expect from your doctor, physical therapist or chiropractor–but in the comfort of your home. This natural, drug-free solution is easy to use to treat persistent pain in your shoulders, neck, back, waist, legs, arms, and more. PurePulse Pro comes packaged with everything you need to get started including the PurePulse Pro digital TENS unit, 4 electrode pads, 2 connector leads, 3 AA batteries, and a convenient storage bag. As a special bonus for purchasing PurePulse Pro, you will receive exclusive access to an instructional video series that shows you how to use your new electronic pulse massager and focuses on ways to treat your pain with and without PurePulse Pro. We’ve partnered with renowned physical therapist Jeff Waldberg to create this free informative series. Kendal Massage Foot Rolling Heat Spa Bath Health Care Box Set Gift Water Unisex Product Features All-in-one: motorized rolling massage, heating therapy, oxygen bubbles massage, water fall & water wave massage, and digital temperature and time control. Plus LED display & remote control. You can adjust temperature from 20 to 48 °C. Water fall function sprays water flow to simulate surfing effects to massage foot and calf. Two water jets surfing water cycle with many massage air bubbles simulating foot reflex zones. It effectively promotes blood circulation, improves metabolism, relieves fatigue, and smoothens the meridians (Qi system). Uses quality PTC heating semiconductor– speed heating, maintaining a constant temperature, and secure multi-insulation protection. Safe and secure double overheating protection. Pre-set programs–heat+ bubble + motorized roller + water fall and wave. Digital timer. With temperature indicator– blue light when below 42 °C; red light when higher than 42 °C. Built-in blowing hot air function to dry feet after use. Self-drainage. Body made of high-quality plastic — high temperature resistance and aging resistance. Beautiful and elegant. Good for personal use and as gifts for others. 110V, 60HZ, 950 watts, UL listed. Comfortably fits up to a Men’s Size 16. Product size: 20″(L) x 15″(W) x 14″(H). Inside Tank: 13.5″(L) x 13″(W) x 9″(H). Weight: 12 lbs. Product Description All-in-one: motorized rolling massage with two massage rollers, heating therapy, oxygen bubbles massage, water fall & wave massage. Digital temperature and time control. LED display. It effectively promotes blood circulation, improves metabolism, relieves fatigue, and smoothens the meridians (Qi system). Secure & Hassle Free Shopping: ALL orders processed via PayPal’s Secure Servers. 100% Manufactures Warranty. Customer Service: Have a Problem? Guarantees Resolution w/in 2 business days (in most cases)! Please message us BEFORE leaving Negative of Neutral feedback. Thank You! Fast Free Shipping: FREE Shipping to 48 Contiguous States. Processing time 2 Business Days (in most cases). Delivery 3-5 Business Days (in most cases). International Delivery: YES, we ship to MOST Counties (via eBay’s Global Shipping Program). Additional shipping charges apply / will appear at checkout. Returns Details: 30-Day Hassle Free Returns. 20% Restocking fee may apply.